The signature block of my e-mail and newsletter reads, “work hard, have fun, stay curious.” This month I’ll write about the “fun” part. I write the Homebuyer Associates newsletter to convey the importance of asking questions, questioning answers and making decisions based on information – not emotion – in real estate and life. I’m a fan of Mamet’s writing, others are not. Roughly 50% of those who receive Homebuyer Associates newsletter open it. Some must be fans, some not. 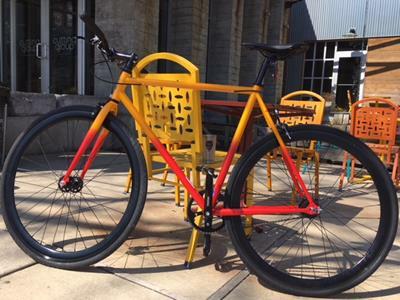 In an effort to have fun, entice you to read and share my newsletter and honor Bike Week (June 2 – 10) Homebuyer Associates is giving away a bicycle in May and June. The bikes are “Fixies” produced by Fyxation Bikes, a Milwaukee Bicycle company. These are limited edition Homebuyer Associates bikes and will be fitted to the winner. Open my late May and early June Newsletters and then send me an e-mail that you’ve done so. If you encourage someone to sign up for the newsletter, and they do, we’ll add your name twice. Think of Homebuyer Associates as the Mamet of real estate truth. You might learn something that saves you dough. You might even learn something else. P.S. If you are not a bicyclist you can still win. Designate who you want to give the bike to and we’ll fit the bicycle to that person. In the meantime, if you have real estate related questions (it’s a wacky market now with some not so smart dollars floating around) or want to know more about Homebuyer Associates please contact us. We’ll arrange for a coffee and some talk.